Normally, plunging temperatures are a cue for traders to make bullish bets because the resulting spike in demand can deplete natural-gas supplies. Last February, prices jumped by more than 30% in a matter of days during one particularly severe cold snap. The usual seasonal rally hasn’t materialized because many analysts believe gas supplies are high enough to get through even a brutal winter with plenty to spare. Daily gas production has set a record for 11 straight months, according to Bentek Energy, a consulting firm. That, plus an unseasonably warm December that weighed on demand, has many investors more worried about a supply glut than a shortage. Changes in natural-gas futures prices can take months to trickle down to heating bills. Most natural gas customers buy from utilities, which contract for most of their fuel months in advance. If natural-gas prices stay low through the spring, savings are likely to show up in the summer, or even next winter. By contrast, people who heat their homes using heating oil or propane may already be seeing savings from plunging oil prices, as they buy their fuel from suppliers who are more closely connected to the wholesale market. On Thursday, gas for February delivery rose 2% to end at $2.927 a million British thermal units, the standard unit of measure for natural gas, after government data showed stockpiles falling by more than expected last week. Futures had ended at their lowest level since September 2012 a day earlier. But investors see prices staying low. As of Dec. 30, they held the biggest net bearish position in the $28.2 billion gas futures market in over a year, according to the Commodity Futures Trading Commission. Gas for delivery as far out as spring 2020 trades below $4 a million British thermal units, with several long-dated contracts recently falling below that price for the first time ever. “You’re getting a selloff now that fear is gone” of a supply crunch, said George Zivic, who manages the $420 million Oppenheimer Commodity Strategy Total Return Fund at OppenheimerFunds Inc. He said gas is fairly priced between $2.80/mmBtu and $3. This time last year marked the arrival of a polar front that brought record cold, and drove natural-gas demand to an all-time high. Stockpiles dropped to an 11-year low by the end of the season. Futures prices jumped above $6/mmBtu in February. Pipeline bottlenecks sent prices soaring above $100/mmBtu in some regional markets. Prices stayed high for much of 2014 as traders feared producers wouldn’t be able to replace all the gas used up last winter. Instead, high prices encouraged producers to ramp up. Citigroup Inc. said earlier this week that stockpiles are on track to exceed storage capacity by October. The bank cut its price outlook for the next two years, predicting an average of $2.70/mmBtu in 2015, from $3 in an earlier forecast. 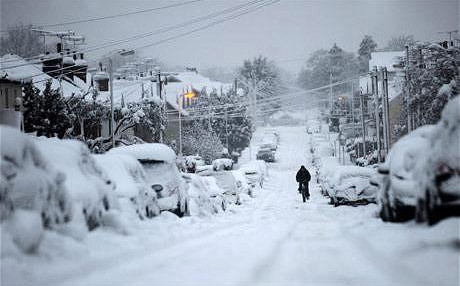 “It’s becoming a dud, this winter season,” said John Woods, president of JJ Woods Associates and a Nymex trader. This week saw a return to single-digit temperatures that regularly blanketed the northern half of the country last winter. Subzero weather and wind chills forced schools to close in Minneapolis and Connecticut to put its emergency workers on severe cold alert. Temperatures fell below freezing in every one of the lower 48 states on Thursday, according to the National Weather Service. The U.S. Energy Information Administration said Thursday that storage levels shrank by 131 billion cubic feet in the week ended Jan. 2, indicating high demand. That is more than the 119-bcf average forecast in a Wall Street Journal survey of analysts and traders, but about 10% below normal for late December, according to EIA data. John Kilduff, founding partner of Again Capital in New York, said he bought gas futures immediately after the data. A severe winter cold snap could still trigger a rally, and even this week’s cold should push prices above $3/mmBtu soon, he said. He added that any bets he made would be small, as the risk of a collapse in prices is strong due to high production. Meteorologists already expect this cold snap to be short-lived. Temperatures as much as 25-degrees-Faherenheit-below normal are forecast to give way to unseasonably warm weather by the second half of January. Local markets aren’t seeing bottlenecks and price spikes like they experienced last year. Prices in a regional hub covering the New York City area hit $20/mmBtu this week. That compares with prices as high as $90/mmBtu last year.